If you follow me on any of my various social media channels, you may have noticed my recent Hama bead obsession. Ostensibly bought for the children, I often find myself of an evening positioning beads onto pegs and coming up with my own designs. We have an excellent local craft shop in our village which carries an incredible amount of stock and I have rather got into the habit of stopping by from time to time to pick up a new Hama bead pegboard (it doesn't help that on many days I pass it four times on the way to and from school). I couldn't resist the Hama bead house template. I assumed that if I looked online I would find loads of inspiration but I couldn't find a great deal so I thought I'd share the houses that I've made using it. They are all made using the Hama Bead House Pegboard , number 306. This house was my first attempt, a sort of Hama bead cottage complete with potted plant outside. It's quite a difficult pegboard to get to know, so I was working out the best arrangements for windows and doors. This fairy house doesn't use the entire template. I was trying for a turret effect, which is something that I'll be trying to improve on for future houses. Finally, this is a Hama bead gingerbread style house for Christmas. Fairly simple for the time being, I can see me revisiting this idea for a more blinged up version! I do have a plan for these houses (and the others that are still yet to be made...) I'm going to create a little Hama bead village somewhere in our house, possibly in Mia's bedroom. We shall see! Do your children have Hama beads? Do you play with them too? I hope that I'm not the only adult that puts the kids to bed and then gets out their toys! I was recently given the opportunity to review some plastic storage boxes from Plastic Box Shop. I love storage and organising products, so I had a lovely time browsing the website. There are always areas of my home which could do with a little sorting out. Hama bead storage was high up my list. We've been buying the big tubs of mixed beads, and it was frustrating when Harry was trying to sort through to find the colours that he wanted. It also suited my organised mind have them divided out by colour. I ordered two compartment plastic organiser boxes, which had plenty of space plus some room left over for our growing collection. Sorting out the beads by colour was a bit of a mission I'll admit, but they look so much better now that they're done! We were lucky enough to inherit a summer house when we bought our house, and it's invaluable for storing the garden toys all year round. It was getting into a bit of a mess though, as we can't resist those end of summer toy bargains. This yellow flexi trug is a really good size and keeps everything together. I'm also thinking that the children could use it in the garden in the summer as a toy in itself, by filling it with water and using it for sitting in or washing toys in. Finally I really want to sort out our wardrobe. We are very lucky and have a walk in wardrobe, but it has become a bit of a dumping ground for all sorts of things, in particular my husband's cable collection and my handy cardboard box collection. I found these large clear plastic storage boxes which fit perfectly into the spaces on the shelves. They turned out to be a little larger than I expected and because they have a half hinged lid I think they'll also be really useful for easy access toy storage. No photos of these in use I'm afraid as I'm still halfway through this organising job, it's not a quick one! I was provided with these products for the purposes of this review. I was recently sent a Cricut Mini Electronic Cutting Machine (affiliate link) from Provo Craft to review, and I've been having a lot of fun trying it out. With the Cricut Mini you can cut out shapes and designs which can be used for all sorts of crafty projects. You can use it for cardmaking, scrapbooking, bunting, gift bags...all sorts of paper crafting. You can also use it for cutting thicker materials like magnetic sheets or vinyl. I was rather intimidated when I first took it out of the box, because there were lots of instructions to follow. But once the children were in bed and I had the chance to look at it properly, it was very easy to set up and install the required software. It didn't take long before I was able to make my first project. The Cricut Mini comes with a few sheets of card stock and instructions which help you to make your very first small card. The machine only actually has two buttons - one to turn it on and one to load the cutting mat. The supplied cutting mat has a sticky surface which holds the card stock firmly in place while the machine is cutting. You simply load the mat into the machine, produce your design on the computer, and click Cut. I was fascinated watching the Cricut electronic cutting machine at work, so I made a little video to show it in action. I was then eager to start using the Cricut Mini for my own projects, so I decided to make some little gift tags using cardstock and washi tape. 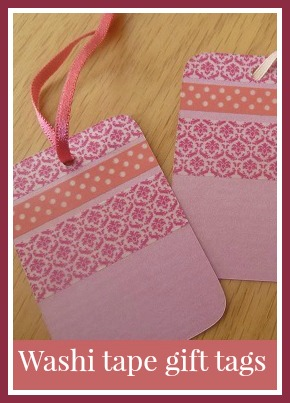 I blogged the full instructions here - Cricut Mini washi tape gift tags - and you can also watch my short video below for a complete tutorial. All the projects that your Cricut Mini will cut are created online in the Cricut Craft Room, so you do need a computer and internet access to use it. You download the free software onto your computer and then set up an account which stores details of the cartridges which you have purchased. There are also plenty of free designs available in your account to use. It's really easy to design your project against a background which mirrors the cutting mat exactly. You simply drag and drop the images and text that you would like to use, and position and shape them as you like. 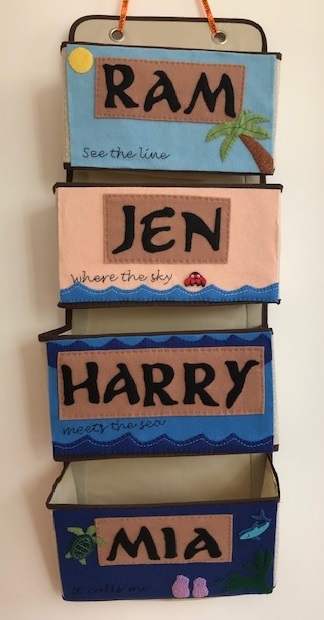 The big limitation of the Cricut Mini is that you cannot cut out your own designs, you can only use the free designs provided or additional images that you have purchased. You do have access via the Craft Room to the entire Cricut image library for design purposes, but you can only cut the actual images that are in your account. It could work out quite expensive if you wanted to buy a lot of images. I did find however that the range of free basic images was very good, and every time I logged in to the Craft Room there were new free images there for me to use. For example, over the last couple of weeks, several sets of Halloween images have appeared. Also, with a bit of practice it is very easy to manipulate the basic geometric shapes into more personalised images. I wanted to create a silhouette image of a haunted house for Halloween, and I was able to make up a simple one just using the basic shapes as below. The different colours represent the different layers in the image. The machine cuts quickly and effectively and the quality of the final cut is good. You need to change the settings for depth, pressure and speed according to the material and designs that you are cutting. You are given some guidance through the craft room software, but it is worth experimenting with this a little, for example I found that it was worth reducing the cutting speed for a cleaner cut. The Cricut Mini is really easy to use. It's small and light, and great if you are making a lot of one item, for example a batch of wedding invitations or Christmas cards. It's perfect for cutting intricate designs that would be almost impossible with a craft knife. I personally don't feel the need to purchase any additional images, as I think that the ones supplied for free will be sufficient for my purposes. For the price I think that it represents excellent value. Disclaimer - I was sent a Cricut Mini to review. Amazon links are affiliate. This week one of the themes for the Great British Bake Off, and hence the Great Bloggers Bake Off, is sweet buns. I decided to make Chelsea Buns simply because I've not made them before and I fancied making something different. I used the recipe in my Kenwood Chef recipe book which you can see here - Kenwood Chef recipes. I use the mixer and dough hook to make my bread dough which certainly makes the whole bread making process much more manageable. Because I hadn't made them before and my recipe book didn't have any good photos of the process of actually making the buns I found a video on-line to give me an idea of how the dough needed to be rolled out, filled and rolled up. Unfortunately the one that I used is no longer available, but I'd definitely recommend looking one up to help! I needed to buy most of the ingredients for these buns, so I'm expecting to be making several more batches over the next few weeks! With these buns I have also ticked another item off my Day Zero Project list - to bake five different types of bread. More on that to follow! I'm joining in with the Great Bloggers Bake Off, hosted each week by The Crazy Kitchen and Mummy Mishaps, and inspiring so many people to create some truly fantastic baked goods! I was very pleased to find this vintage copy of the Ladybird book Talkabout Clothes because it is one that I remember vividly from my own childhood. Talkabout Clothes is part of Series 735, aimed at younger children and published in 1974. Harry is 4 1/2, and we really enjoyed reading this book together. It talks about clothes for different weather, different jobs and different occasions, how clothes are made and how they are put on. There are also plenty of little puzzles for children to solve, for example finding out where a patch has been sewn or finding matching buttons. In addition there are lots of sequenced illustrations which the child can use to tell a story, which is exactly like the reading books that Harry is bringing home from school at the moment. I must have read this book a lot when I was little because it was all very familiar to me, a very nostalgic read. At the back of the book are plenty of suggestions for ways in which to enjoy reading it with your child. I love that this book is more than just a reading book, it's a real interactive experience to share. In 2017 Diwali will be celebrated on the 19th October. I've done plenty of Diwali crafting with the children, but until now we had never yet attempted to make any kind of Diwali treat to eat. Many of the recipes that I found online used unfamiliar ingredients, and I wasn't entirely sure what I would end up with. But in the library the other week I found a great book - Festivals of the World - India - and in it was a really easy recipe for Burfi - a simple Indian treat. It's a basic recipe which can be changed around and adapted by using different types of nuts and flours. Because it's so simple it's really easy for children to help with. Put the cashew nuts into a frying pan and cook them over a low heat until they are a golden brown. Grind the roasted cashews using a blender, or simply crush them with a rolling pin. Mix together half the ground cashew nuts, the condensed milk and the flour in a saucepan. Cook for a few minutes until it is almost solid. Grease a baking tray and press in the cashew mixture. Pour the remaining ground cashew nuts over the top and press them down, then cool in the fridge before cutting into squares. If you are looking for things to do with young children to help them learn about and celebrate Diwali, you might enjoy some of my other Diwali craft and activity posts. Follow Jennifer Jain's board Diwali Crafts and Activities on Pinterest. We were recently sent a Cheerin' Minnie to review. The Minnie Mouse Bowtique Cheerin' Minnie is a brand new toy from Fisher Price, aimed at young children aged 2 and over. We're big Disney fans in this house, and both children love watching Mickey Mouse and friends on television. Mia recognised Minnie Mouse immediately, and was delighted. Cheerin' Minnie is about 36cm tall and freestanding. She is dressed in a polka dot cheerleading outfit and has a pink and white pom pom in each hand. She is activated by pressing a small button on her foot. As you can perhaps tell from the video, Minnie does make quite a noise while she's moving about. It's more obvious on the video, but you do definitely notice it while she's playing. The children did really love playing with Minnie, and were desperate to keep pressing her foot to see what she did next. She seems very sturdy and I'd be happy to let a toddler play with her and cuddle her. She's also very simple for toddlers to operate, and they will enjoy dancing along with her. She's not even too annoying for grown ups (although we've only owned her for a day, I may change my mind on that one!) It remains to be seen how long she will interest them for, as once you've scrolled through all her phrases and songs a few times there's not much else that she can do. The RRP for Cheerin' Minnie is around £50. While this is comparable to similar electronic toys on the market, I do feel that for this money you could probably find toys that will have a bit more play value to them. However if you have a little one that loves Minnie, then she will be a big hit. I think that she would also appeal to much younger toddlers and babies if used under supervision, as they are more likely to enjoy sitting and watching her singing. I know that we had similar toys which really calmed down my babies when they were grumpy. You can buy Minnie Mouse from many large retailers, including Amazon and Smyths Toys. We received Cheerin' Minnie to review, Amazon links are affiliate links. This article on BBC News caught my eye the other day - Keep reading with your children, parents urged. Apparently 44% of the parents surveyed rarely or never read to their children after their 7th birthday. Actually, this surprised me, because that means that 56% still do, and that still seems pretty high to me. I know that my parents weren't still reading aloud to me at that age, and I don't think I would have wanted them to, I think I was quite happy reading by myself. I've never imagined myself reading aloud to my children once they could read confidently themselves. However I do love reading to Harry at the moment, and I am impatient so start reading some more grown up books with him. At the moment he's at the very beginning of the learning-to-read-scheme from school, and he's bringing home the books which just have pictures for him to tell the story. I'm afraid I find it difficult (and boring) to 'read' these books with him - he's read them at school that day so he knows the story already, and he's not interested in discussing the illustrations. I prefer to read a more involved story with him (the Mr Men books have been favourites for a little while, or some of the Ladybird books with a longer story) and then he can ask questions based on what he has understood from my reading. Obviously I don't have any experience of older children, and I really would love to know what sort of books parents read to their children that can already read themselves. Do you read books that they are capable of reading by themself, or do you read books that are beyond their reading level? I've had a pretty good couple of weeks when it comes to the acquisition of Ladybird books for my collection. First my Mum hunted some down for me on a recent trip around the country, then the Findon Sheep Fair yielded some unexpected vintage finds. Finally, a trip yesterday to drop the car off at the local garage meant a wander around some previously unexplored charity shops and some excellent purchases. One of the shops had a whole box full of vintage Ladybird books, and I spent ages agonising over just how many I could justify buying! This week I'm choosing a very timely addition to the collection - Going to School. Published in 1959, this book pre-dates even my own primary school experience by a long time. It's in series 563, a Ladybird Learning to Read Book. Other titles in the series include 'Shopping with Mother' and 'Helping at Home'. It's aimed at both children already at school and learning to read, and as an introduction for those that are about to start school. As with all Ladybird books, it has some wonderful illustrations. We follow a little boy and girl through their school day, from when they arrive and take off their coats and hats to when they leave to be collected by Mother. Even though the children portrayed in the book are now grandparents, this typical outline of the day represents almost exactly what Harry does during his day at school - reading, writing news, crafts, role play, number work. I would actually love to spend a day at this school myself, with its singing, pottery and woodwork. 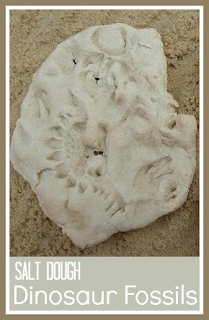 Recently I came up with some crafts and activities for Dinosaur Day, and one of those was salt dough dinosaur fossils. They were a a really successful craft with a lot of play value, and so in this post I'm going to expand on how we made them. I have a standard recipe which I use for salt dough - 2 cups of plain flour, 1 cup of salt, 1 cup of water. Just mix it all together, adding the water gradually until you have a firm dough. I rolled the dough out by hand into small flat shapes and then the children and I used a variety of things to make imprints into the dough. As well as small plastic dinosaurs we also used shells, small stones, leaves and twigs. We pressed the plastic dinosaurs in sideways and also used their feet to make little footprints. 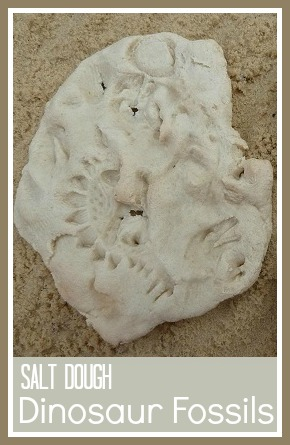 I baked the salt dough fossils in the oven for about half an hour on a low temperature and then left them out for a few days to air dry. I've found that the best way to dry out salt dough is to leave it on a hot radiator for a few days to make sure that it's completely dry all the way through. When they were dried through we used them for some dinosaur play. Harry's favourite activity was burying them in the sandpit and excavating them. We used spades to dig them up and a paintbrush to remove the sand. We also hid them through the house to find. I was recently introduced to PaperShaker. Using the PaperShaker website you can design unique and personalised cards and invitations, using your own photographs that you have uploaded to the site. The cards are then printed and sent out to you. I was given £25 credit to spend on the site so that I could share my experiences with you. When I first started browsing the site I must admit I was a little overwhelmed with the amount of choice available. But you are easily able to filter down to sort out the options. I knew that I wanted cards with just one photograph for example, and by the time I'd chosen the size and type of card I was left with a more manageable amount to choose from. I wanted to make some Thank You cards that we could send from the children, with a nice picture of them on the front and space inside for them to write or draw a message. I chose the Little Days card and updated some of the graphics to make it less like a baby card. Every part of the card can be customised - I removed some of the more baby style pictures inside, added a generic "Thank you very much" message and added our address to the back of the card. I also rearranged some of the graphics on the front and added a couple more. We never had birth announcement cards for the children, leaving our announcing mainly to Facebook, but I do wonder whether we should have, so I made one up for each of them using PaperShaker. I found designing the cards really easy, there are lots of different elements that you can choose from for each card and when you place the items they snap to fit, so everything is neatly aligned. As well as adding in the relevant birth information you can add as much extra text as you like, and all the graphics can be moved, removed, or replaced with others from the same theme. There are also plenty of designs which allow you to use more than one of your photographs. On the back you can add extra text or more information, or leave space for a handwritten message. The website is very much geared towards specific categories - birth announcements, thank you cards, party invitations and wedding cards. But because the cards are so customisable you really can use them for anything by making some changes to a suitable template. I put together a starting school card for Harry, using the Thank You Star design and changing the graphics so that it didn't look like a baby card. On the back it has the name of the school, his class and his teacher, as a little memento. So don't be put off if you are looking for cards for an occasion that is different to those featured. The cards arrived the day after I ordered them - fantastic service! I was very pleased with the quality of the cards, they are sturdy and the photographs are printed to very high standard. This week, the theme for the Great Bloggers Bake Off challenge is pies. I've never even made my own pastry before, let alone a whole pie, so this was a definite challenge for me! I decided to make a savoury pie, as I'm also trying to come up with some new evening meals for the family. I love Emily's beautiful food blog at A Mummy Too, and I was inspired to try her Cheesy Lentil Pie. I went over to Asda to buy my ingredients, but unfortunately I wasn't able to find any cornmeal flour for the pastry. Undeterred, I looked up some recipes online for pie pastry and found this rich or sweet pastry recipe. Obviously the clue is in the name, but I just assumed that the sugar was somehow integral to the pastry making process, and used this recipe, making double quantities as I guessed that the original recipe would only make enough to cover the top. The pie made enough for five generous helpings, and it also froze well. I'm really pleased with myself, and I can't wait to find out what next week's challenge is going to be! I'm joining in with the Great Bloggers Bake Off, hosted each week by Mummy Mishaps and The Crazy Kitchen. 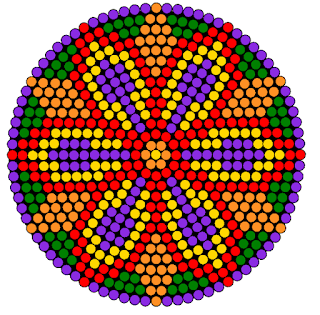 The other day I blogged about some small Hama bead Rangoli designs that I had created as a Diwali craft for the children. 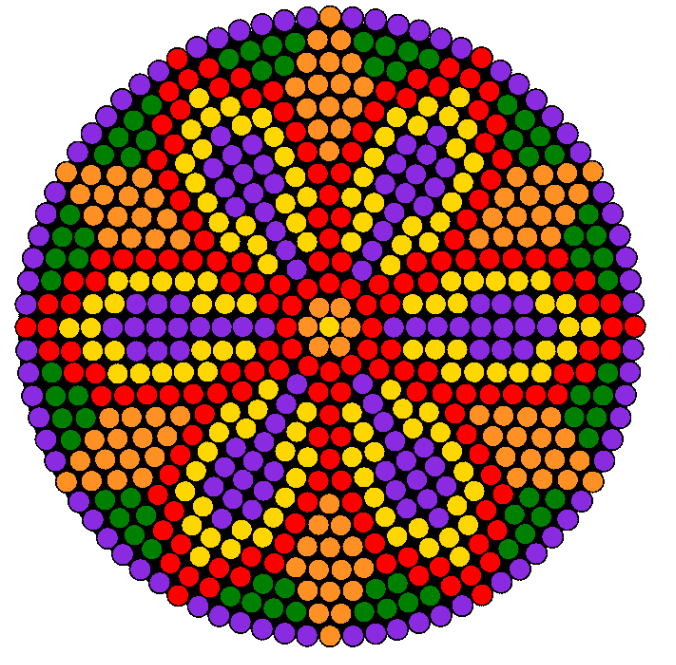 I'm afraid that my growing Hama bead obsession wouldn't let me leave it there, and so I have also made some bigger Hama bead Rangoli patterns, using the larger circular template (221). These are a lot more complex and so are probably better suited to older children or adults who have more dexterity and patience. I found it easiest to assemble them by working from the centre outwards. As well as being pretty Diwali decorations they would also look good on a Diwali table, either as a centrepiece or as coasters for drinks or plates of food. These larger Hama bead designs can take quite a while to make, and you need to be a bit more careful when ironing to make sure that all the beads have melted properly. After taking the photographs I ironed them on the top side too, to make them a bit sturdier. I stuck to the same colours for them both, but it would be easy enough to use different colours, keeping to a bright and cheerful colour scheme. I'm really pleased with them! 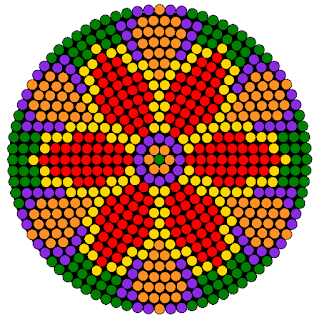 My Hama bead patterns were created using this free online Hama bead designer. You can read about our more recent visit to Whipsnade Zoo here! We've had a brilliant summer this year. We've been out and about and we've also had some lovely days at home, with themed crafts and activities as well as plenty of sunny water play in the garden. We finished off the holidays with a short weekend break away, using some vouchers that I won for a day trip to Whipsnade Zoo, a night over in Dunstable and then my niece's 5th Birthday party on the Sunday. We first visited Whipsnade Zoo a few years back when Harry was about 6 months old. We were desperate to start taking our baby out and about on day trips, and we convinced ourselves that it was the perfect outing for him, despite the fact that he would probably have been just as entertained by going for a walk down the road. This time the trip was definitely for the children, both of them old enough to appreciate and enjoy the day out. We used our vouchers for entry, which would have cost us £21 per adult and £16 for a child (under 3 years are free). In addition you have to pay £4 for parking. There are also extra costs once you are inside - a ride on the Jumbo Express Steam Train is a whopping £4 per adult and £1 per child (we managed to steer the children away from this). There is however a free bus which you can use to ride around the park. Our first stop was the indoor soft play area Hullabazoo, new since our previous visit. Because it was a busy day they were operating timed slots, so we went early to book a slot for later in the day. It was empty just after opening so we let the children play there for a while then too. I was very impressed with it, it was large, clean and with an excellent level of staff supervision. There is an outdoor play area too which again was very good. But of course we were really here to see the animals. Although there were a lot of people there we found ourselves in a quieter area of the zoo and we didn't feel that it was too busy. Harry particularly loves giraffes, and we were fortunate to be visiting the enclosure at feeding time. We watched the keepers prepare and set out the food, and then admired the way that the giraffe ate his leaves with his long black tongue. There were plenty of little exhibits along the way, with extra information about the animals. The elephants were also very popular, and we ate our sandwiches here watching them drink through their trunks. Later in the day we were amazed to see some of the keepers taking the elephants for a walk along one of the public roads, all using their trunks to hold on to the tail of the one in front just like in the Jungle Book! The Discovery Centre is a nice indoor attraction to visit, with an opportunity to get close up to various insects and creepy crawlies without it being too busy. At the end there is an area where children can do various crafty activities - although at £2 for some colouring sheets we hurried the little ones quickly past! There are a few little animals which roam freely around the grounds which the children loved. For the larger animals the enclosures feel very open and spacious which is nice to see. We also enjoyed the Children's Zoo, where the children could stroke a sheep and admire some sweet miniature ponies. You can also enter the lemur enclosure and see them close up. Whipsnade Zoo is vast, and Harry did struggle a little with the walking around the park, as he's not a very keen walker. In fact for some of the day he even sat in Mia's pushchair while she walked. There is a free bus, but we didn't use it as we had the pushchair piled up with bags and things, but we probably should have investigated it. Interestingly, you can also take your own car inside the park which costs £20. The whole park is pushchair accessible and there is plenty of space to move around. You can however find yourself quite some distance from a toilet. Typically the one time that Mia really needed changing the only toilets nearby were portaloo style with no change facilities, meaning that I had to change her on a box in the open outside. We spent a full day at the zoo and there was plenty to see, an excellent variety of animals and the indoor and outdoor playgrounds were fantastic. I'd definitely recommend a visit. I was recently lucky enough to receive a fabulous Cricut Mini (affiliate link) to review. While I'm getting to know the machine I've been making a few little projects, and I'm sharing my very first one here. I recently discovered washi tape, and I've been using for a few little crafty makes. These little gift tags are made with washi tape on card stock and cut out using the Cricut. Of course, if you don't have a Cricut, you can just cut them out by hand. The gift tags are very simple to make up. Take a sheet of light cardstock and run a few strips of washi tape across the top. Make sure to stick it down firmly. 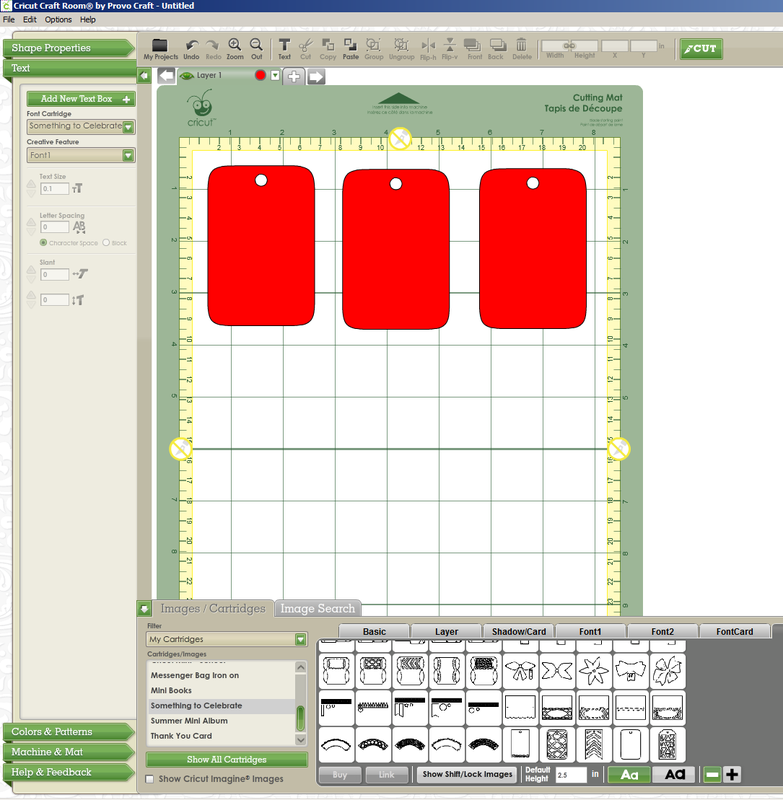 Lay it down on the cutting mat and open up the Cricut Craft room software on the PC. For the gift tag template I used a shape that came free with the Cricut Mini. It's from the Something to Celebrate cartridge. Under the Décor tab, it's called HvngPrty. I enlarged it slightly, then copied and pasted it across the screen to make three tags. 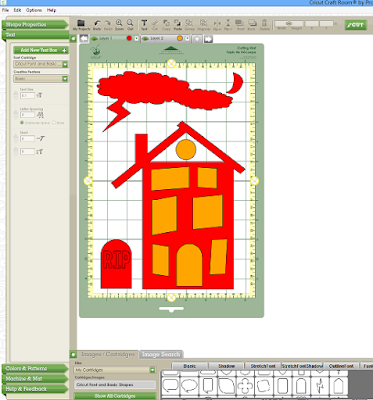 The layout on your screen corresponds exactly to the cutting mat that you are using so you can work out where to position your shapes. I used the setting for medium card stock which worked fine and the shapes were cut beautifully. Once the card stock is removed from the machines, peel it away and reveal your lovely gift tags! I added some ribbon through the top. The space at the bottom is perfect for adding the name of the recipient. The world of the Cricut is all very new to me, so if you have any projects to share or any tips I'd love to hear about them! Disclaimer - I have received a Cricut Mini which I will be reviewing in full on the blog shortly, I'm just learning what it can do first! I approached this week's Great Blogger's Bake Off challenge with a little trepidation. The recipe choices this week were trifle (which I'm not keen on), floating islands (also something that I'm not very fond of) and petit fours (I didn't have a clear idea what these were). After a bit of research and Pinterest browsing I decided that petit fours were the way to go. There are lots of different variations, and I decided that I could come up with something that was tasty and small enough to pop in the mouth in one go. So I made some cookie and brownie bites, smothered in melted chocolate and topped with a Malteser. They took me most of the day to make as there are lots of different stages. My recipe makes plenty, I reckon enough to make at least 40 bites (allowing for natural wastage due to nibbling throughout the day). The brownie base recipe is from a chocolate brownie cheesecake recipe that is my brother's speciality, and the cookie recipe is the basic recipe that I always use. Cream the butter and icing sugar, beat in the eggs and add the melted chocolate and flour. Pour into a baking tray (mine measures 30 x 20 cm) and bake at 180C for about 25 minutes. Leftover chocolate cut into chunks, Maltesers etc. Cream the butter and sugar then add the flour and syrup. Add chocolate chunks if you like, or perhaps the rest of the bag of Maltesers. Press out into a baking tray (mine measures 30 x 20 cm). Bake at 180C for about ten minutes. Remove from the oven when it has started to brown slightly on the top. It will still appear puffy and soggy, but it will flatten and harden up when it has been left to cool for half an hour or so. Make up the brownie and the cookie bases. Use a knife or cutter (I used a small flower cutter) to cut them out into little bites, about an inch square. Leave in the fridge for a short while to harden and make assembly easier. Melt the leftover dark chocolate, and use a small blob to stick a brownie piece on top of a cookie piece. Return to the fridge to set. Melt the milk chocolate and use a spoon to pour over the top of the bites, allowing it to run down the sides. You could dip the entire petit four in melted chocolate for a more indulgent treat. Top with a Malteser, then return to the fridge to set. I was so pleased with these petit fours, they were absolutely delicious! I think that they fit the criteria, and you can just about fit them in your mouth in one go if you open wide! I'm linking up to the Great Bloggers Bake Off, hosted by Mummy Mishaps and The Crazy Kitchen. As I start writing this post, I want it to have a hook, a twist, that makes it different from all the other 'my child started school' blog posts that will be published this week. But I blog to record all the memories that our family is making, and so this post is to capture an important day in the life of our little family, the day that Harry started school. Early mornings aren't a problem in our household, so we had plenty of time to get ready. I bought Harry a little Playmobil starting school figure which I left in his room last night for him to find when he woke up. Then I also made him a Schultüte, using instructions from Red Ted Art, as a starting school present. I filled it with pretty bits of stationery that are just for him, and some sweets. He ate his breakfast super quick, then announced that he didn't have time to brush his teeth as he didn't want to be late for school. I corrected him on that one, and then he got himself dressed in his school uniform, including the tricky button on the trousers and the shoes that he had refused to practice! We spent plenty of time taking photographs inside and out. Although Mia has been going to nursery for a few months now, it was also her first morning without Harry there, so we had to take her there first and make sure that she was settled. Fortunately she waved us goodbye happily. Then Ram drove us over to the school. We were early of course, as I always am, so we waited in the playground until the door opened and we all piled in. It was a bit chaotic with lots of excited children and parents cramming inside, but we found homes for his PE bag, jumper, lunchbox, book bag water bottle, fruit and his shoebox, which he had to fill with things that were special to him. Then he called out 'bye' and that was our signal to leave. It looks as though he has settled in absolutely fine. He will be attending full time from his first day, so it's going to be very tiring for him, and I'm sure that he won't greet every morning from now on in with the same enthusiasm. I do feel emotional, but it's also a relief that the first day is now over after such a big build up. Now I find myself in an empty house, with the prospect of a morning and lunch by myself for the first time in years before I go to collect Mia!